On October 30, the VA Ann Arbor Healthcare system held a celebration, complete with balloons, treats, and many smiles. 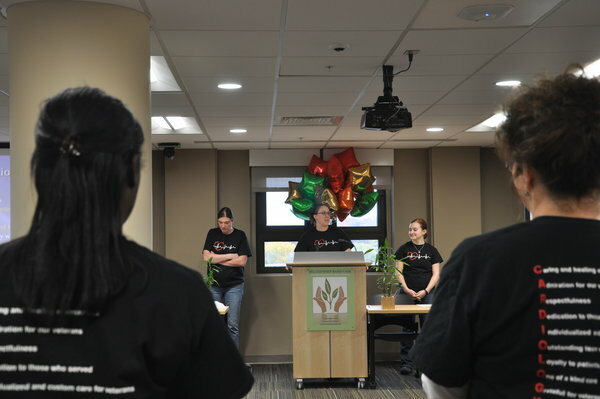 It marked the completion of the first wave of Relationship-Based Care (RBC) team implementation; a model of care that focuses on quality improvement through creating culture change beginning with relationships. These relationships are to oneself, to colleagues, and to the veterans and their families. 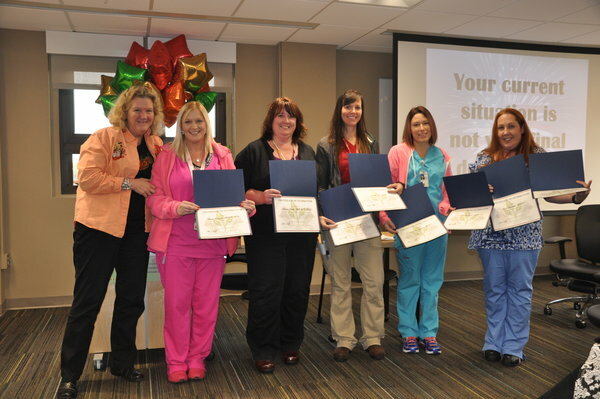 This six month process included four units in the hospital, each engaging in a change process and employee engagement strategy, lead by Clinical Nurse Leader Stacy Frick and Creative Health Care Management. The celebration included presentations by the leadership team, veterans, and the four units that took on the challenge of effecting change. Each unit had a Unit Council that led efforts. The RBC steering committee attended an RBC Leadership Practicum to be trained on leading change and held focus groups that explored the existing culture. Staff were taken through a three day seminar “Re-igniting the Spirit of Caring;” an interactive workshop to break down barriers, explore purpose, and remind team members of the value of their work. Facilitators were then chosen to attend a new facilitator training, and wave one of testing RBC began in the units. As part of their work, each Unit created a communication board, a vision statement, a communication tree with names, and identified a change project. There were challenges along the way with difficulty finding common meeting times, key staff turnover, and the expected resistance to change from some. Ultimately, they pressed on, holding to the philosophy “work with what you have and don’t worry about what you don’t have”. RBC has been shown to improve health outcomes, reduce expenses, and increase patient satisfaction and compliance. The project has full support of management, with Director Robert McDivitt in attendance and giving glowing closing remarks of encouragement to all. Celebrations will be held every six months, as the project is spread to other units. Indeed, small efforts are making a large difference in how staff sees themselves, their co-workers, and the veterans and families that they care for everyday. Do you have a unique method for developing teamwork in your organization? Contact Stacie Longwell Hill at [email protected].